There are enough pictures of the Kardashian/Jenner family floating out there on the Internet to fill a thousand photo albums. However, we don't see quite as many photos of Scott Disick and Kourtney Kardashian's family that feature their inordinately cute band of little ones. I'm here to rectify this error. Yes, the Kardashian-Disick family is a handsome one indeed, from squishable 5-year-old Mason to 5-month-old Reign. 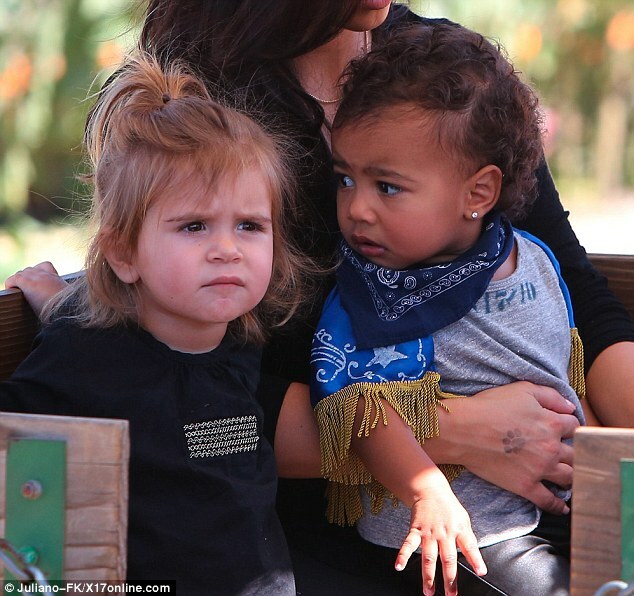 And let's not forget only daughter Penelope, 2, who always looks so endearingly un-amused. It goes without saying that these ridiculously adorable kids are likely to grow up to be comely lads and lasses. How could they not? Mama Kourtney is obviously genetically blessed, and despite his idiosyncrasies, the Lord isn't so bad himself. When this group gets together, they truly enjoy each others company. They go to the beach! They swim in the pool on the Disick mansion grounds! They watch television! Being that the youngin's in this family are all still at very cute ages, there are, of course, pictures taken of all of these activities. As my own good deed for the day, I've assembled some Kardashian-Disick family photos for your viewing pleasure. Let's cross our fingers for a family Christmas card next year. Penelope is getting the star treatment, being lifted by the whole family. Infant Penelope has no clue what to make of this. Again, Mason is effusive. Again, Penelope is over it.